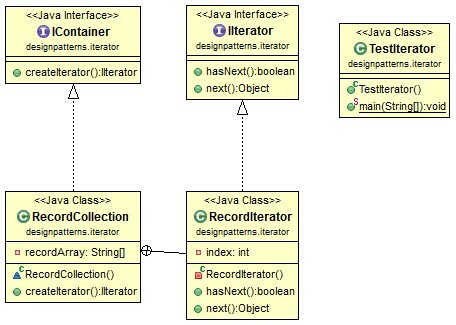 Iterator pattern is used to iterate through a collection of objects. It is a commonly used pattern, you probably have used it before. Whenever you sees something like hasNext() and next(), it is probably a iterator pattern. For example, you may iterate through a list of database query record. Then there are class that can create an Iterator, e.g., TreeSet#iterator(), HashSet#iterator(), etc. Great article, its very useful and helpful to know about java design pattern iterator,i was unknown to this but now got to know how to use it. Basically, an iterator provides an indicates of “looping” over a shown choice of factors.